DVD Synopsis: While searching for missing teenagers, novice skip tracer Maggie McKeown (Heather Menzies) and local town boozer Paul Grogan (Bradford Dillman) stumble upon a top-secret Army laboratory conducting genetic research on piranha fish for the purpose of developing biological warfare. When the deadly eating machines are accidently released from the compound, they're soon headed downstream and consuming everything, and anything, in their path. 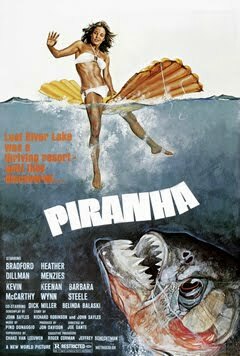 Produced in 1978 by Roger Corman's New World Pictures, Piranha was to be little more than a low-budget thriller that would capitalize on the success of Steven Spielberg's Jaws, which broke all box-office records a few years earlier. But with the likes of Joe Dante directing and John Sayles penning its script, Piranha would go far beyond simple exploitation to become a thrilling bit of entertainment in its own right. Like Jaws before it, the tension generated by Piranha relies heavily on the film's attack scenes. However, since the title characters spend all of their time under water, thus almost entirely out of sight, the filmmakers had to develop a signal to let the audience know that these deadly creatures have arrived. In Jaws, Spielberg addressed this same problem with the help of composer John Williams, whose sinister score is still one of the most recognizable in film history. In Piranha, the warning system was much less subtle. Instead of music, Piranha relies on the sound of gnashing teeth, as if the creature’s lethal mouths were in a constant state of motion. While It may not be as memorable as the Williams score, that foreboding, ravenous chomping generates just the right amount of anxiety. For all intents and purposes, Piranha had no business being this entertaining. The entire reason it existed at all was the quest for the almighty dollar. Fortunately for us, there were too many talented people involved with the making of Piranha for it to have been anything less than a hell of a lot of fun. "They're eating the guests sir!" Classic line! @Cyberschizoid: Oh yeah! The actor who delivers the line is so matter-of-fact about it, too, which is what makes it so good. "Terror, Horror, Death. Film at Eleven"
Sayles wrote a number of B movies when he was starting out, and all are worth seeing, especially THE HOWLING (another collaboration with Dante) and ALLIGATOR & THE LADY IN RED (both of which were directed by Lewis Teague). Also, BATTLE BEYOND THE STARS is an amusing sci-fi riff on SEVEN SAMURAI. I've included ALLIGATOR here already (a very entertaining movie), and have seen THE HOWLING (another gem), but haven't yet checked out LADY IN RED or BATTLE BEYOND THE STARS. They will be added to the already-staggering list of films I must see at some point! ALLIGATOR is the only reason I knew who Robert Forster was when JACKIE BROWN came out. He's very good in both films. Back in the mid-80s, we thought Teague was going to be a big deal. But after the Sayles-scripted TV show "Shannon's Deal" failed, his career settled into mediocrity. My first Robert Forster film was actually MEDIUM COOL...I saw ALLIGATOR after JACKIE BROWN. He was excellent in all 3 of these films. What a great "monster" movie. I love that a "rip-off" ended up being its own movie after all. I always fantasized of a movie about sharks vs. piranha. Maybe one day.